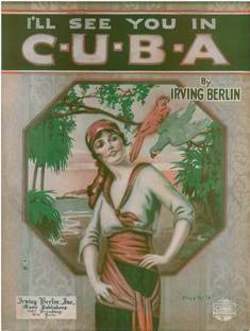 Back in June, we wrote about Irving Berlin's Prohibition song I'll See You in C-U-B-A, one of the pieces of sheet music that's on view in "There'll Be a Hot Time in the U.S.A.": Illustrated American Sheet Music, 1917-1924, the current exhibition in the Library & Archives reading room. This week, we're taking a look at one of the other Prohibition-inspired songs that's also in the show, a song called At the Prohibition Ball. When I was first trying to decide how to select thirty pieces of sheet music out of hundreds to choose from, I realized very quickly that the pieces fit easily into various themes or topics and that each exhibition case could focus on one of these topics. Because of the time period, one of the themes that made itself apparent was Prohibition. After selecting five Prohibition-themed pieces of sheet music for the exhibition, I was struck by their publication date. All but one were published in 1919. The 18th Amendment to the U.S. Constitution was ratified on January 16, 1919, but it didn't take effect until one year later, on January 16, 1920. Section 1 of the amendment reads, "After one year from the ratification of this article the manufacture, sale, or transportation of intoxicating liquors within, the importation thereof into, or the exportation thereof from the United States and all territory subject to the jurisdiction thereof for beverage purposes is hereby prohibited." The Prohibition songs written during 1919 weren't based on the reality of Prohibition, but instead reflect the anxiety of what social life in America might be like once the country went dry. It will be the night before the Prohibition Law! We'll celebrate at the Prohibition Ball! The exhibition, "There'll Be a Hot Time in the U.S.A.": Illustrated American Sheet Music, 1917-1924, will be on view until January 25, 2009.